You are currently browsing the tag archive for the ‘125Moments’ tag. Fay returned to Chicago and quickly found support for a new orchestra. 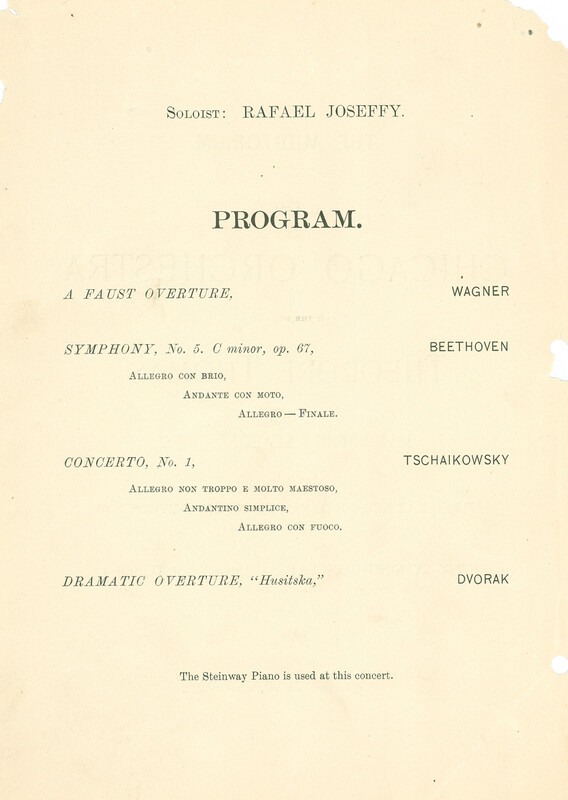 The Orchestral Association first met on December 17, 1890, and less than a year later, on October 16 and 17, 1891, the Chicago Orchestra gave its first concerts at the Auditorium Theatre, with Thomas conducting Wagner’s A Faust Overture, Beethoven’s Fifth Symphony, Tchaikovsky’s First Piano Concerto with Rafael Joseffy, and Dvořák’s Husitská Overture. 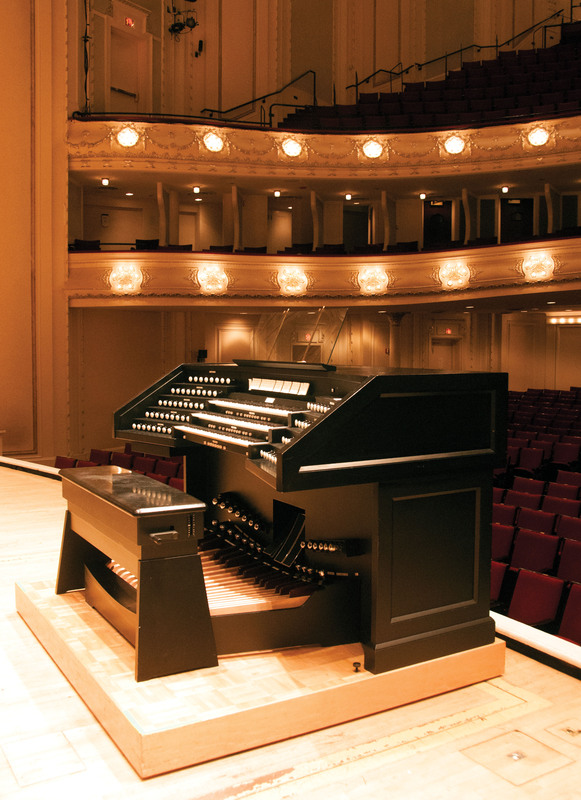 In January 1970, the Chicago Symphony Orchestra and its new music director traveled to New York for their first concerts together in Carnegie Hall. 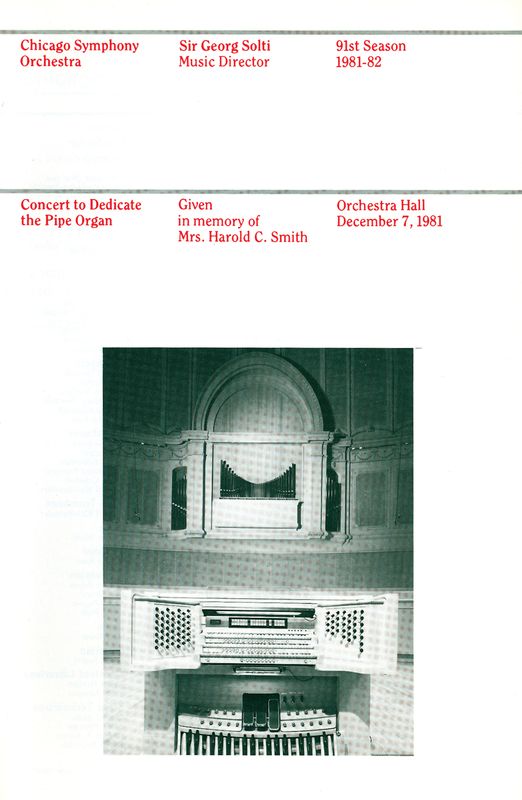 The concert on January 8 included Georg Solti leading Haydn’s Symphony no. 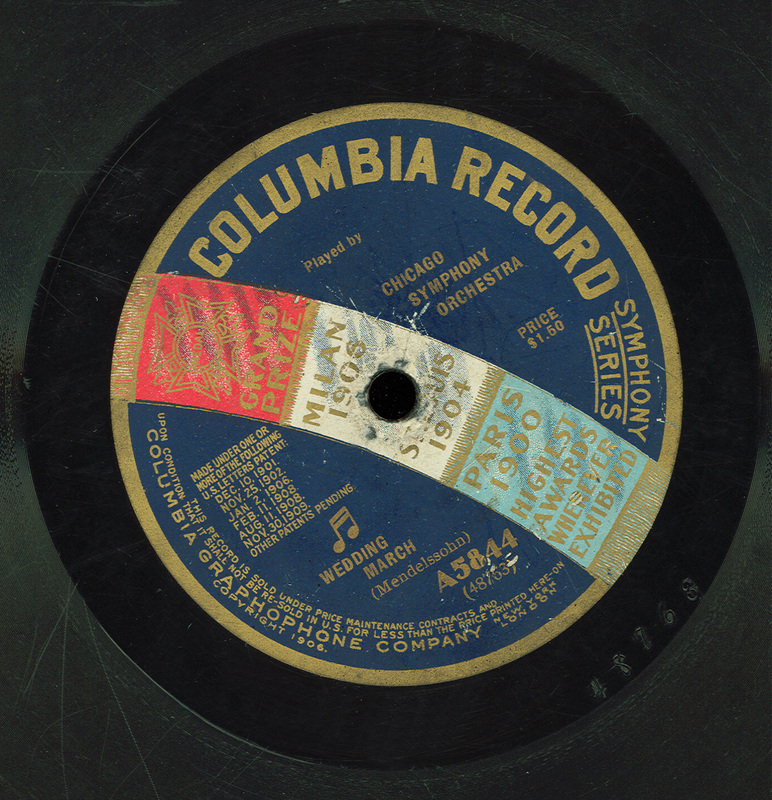 102, Bartók’s Dance Suite, and Brahms’s First Symphony; and the following evening, the program was Mahler’s Kindertotenlieder with contralto Helen Watts and the Fifth Symphony. Solti and the Orchestra were hardly prepared for the reception following the January 9 concert. 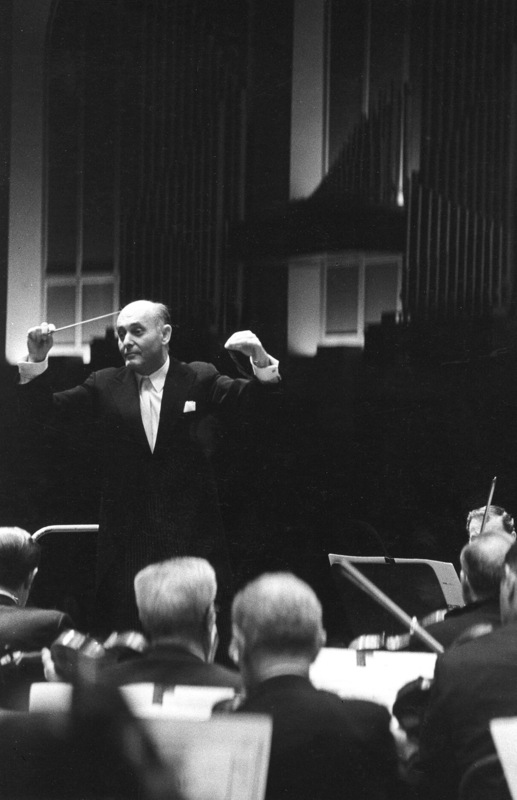 Multiple accounts reported the thunderous cheers and applause—calling Solti to the stage for twelve curtain calls—that continued even after the performers had left the stage. 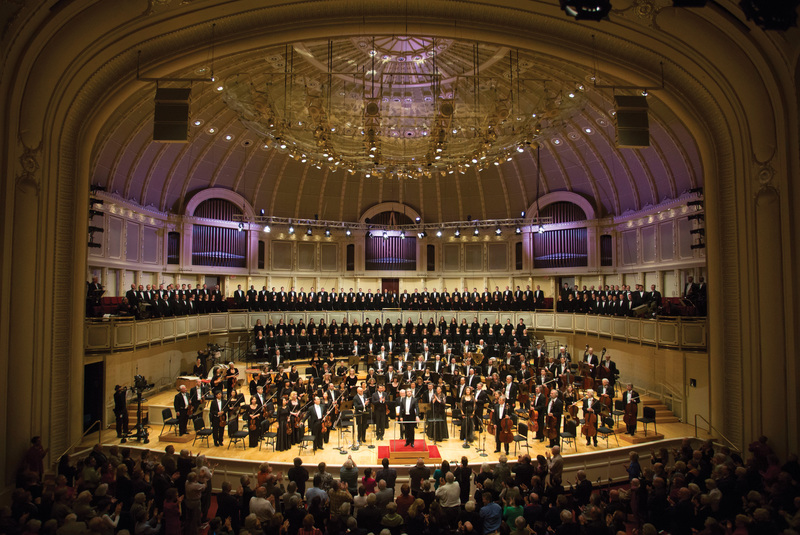 “Is the Chicago Symphony the greatest orchestra in America? Stravinsky has said so, and it was impossible not to agree with him when this orchestra appeared in Carnegie Hall last Friday night in an all-Mahler program under the baton of Georg Solti,” wrote Winthrop Sargeant in The New Yorker. “Its brass section is unique in its power and beauty of tone, and its first horn player [Dale Clevenger] is a virtuoso who has a huge tone or a delicate tone—whichever you prefer—and who can hit his upper notes with exemplary accuracy. The woodwinds and strings are not far behind. There is a solid craftsmanship about the whole ensemble, which leaves the conductor nothing to do except exert his leadership and artistic ideas. The Orchestra itself is already trained in everything that pertains to technique, intonation, beauty of tone, and accuracy of attack. Add to all this a conductor of Mr. Solti’s stature (there is none greater at this moment in history), and you have an unusual treat. . . . 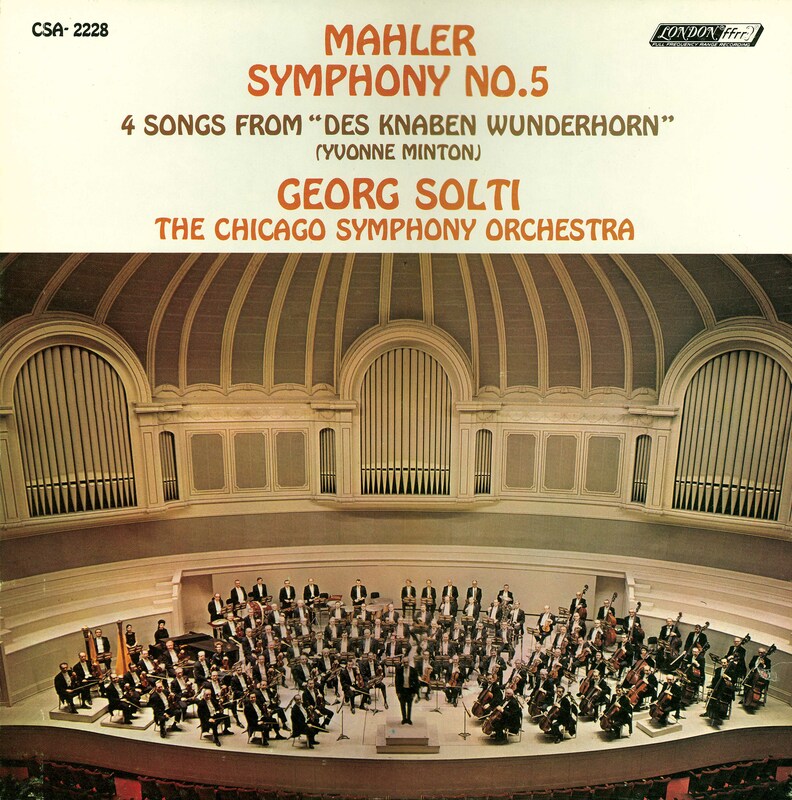 In March and April 1970 at Medinah Temple for London Records, Solti and the Orchestra—collaborating in recording sessions for the first time—recorded Mahler’s Fifth and Sixth symphonies along with the Songs of a Wayfarer and selections from Des Knaben Wunderhorn with mezzo-soprano Yvonne Minton. During Daniel Barenboim’s first season as the Chicago Symphony Orchestra’s ninth music director, several concerts included music by Mozart to commemorate the bicentennial of the composer’s death. 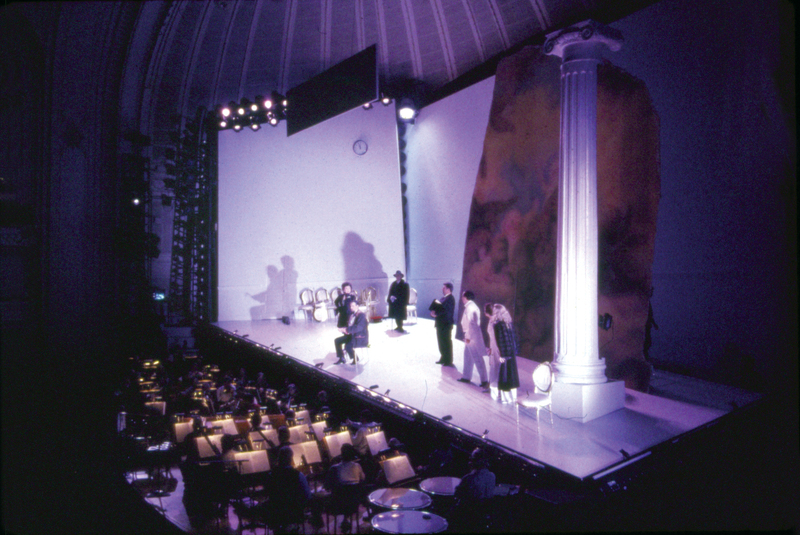 The commemoration culminated in February 1992, with the transformation of Orchestra Hall into an opera house as Barenboim conducted (from memory) performances of the three operas by Mozart with librettos by Lorenzo Da Ponte—The Marriage of Figaro, Così fan tutte, and Don Giovanni. Presented semistaged in rotating repertory, the productions featured such leading singers as Lella Cuberli, Joan Rodgers, Cecilia Bartoli, Waltraud Meier, Ferruccio Furlanetto, and Michele Pertusi, with costumes by Oscar de la Renta. 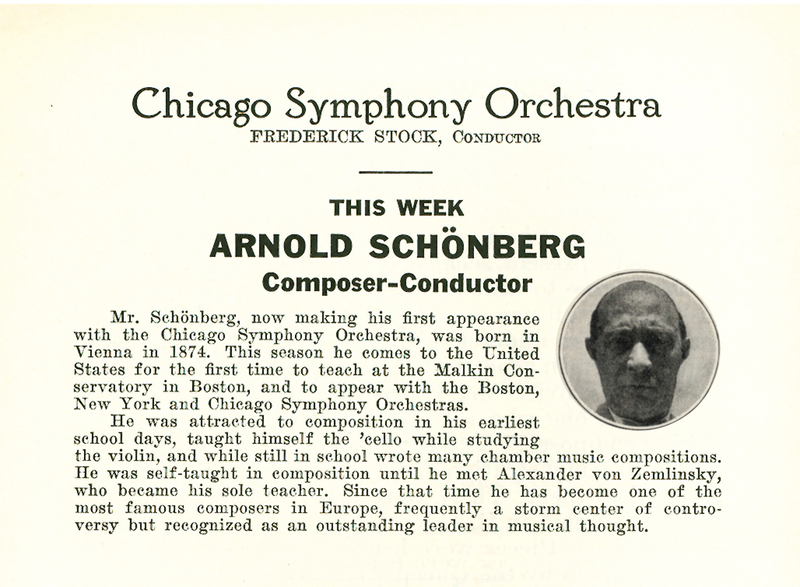 Arnold Schoenberg composed his Five Pieces for Orchestra in 1909, and they were first performed at a Proms concert in London on September 3, 1912, with Sir Henry Wood conducting. 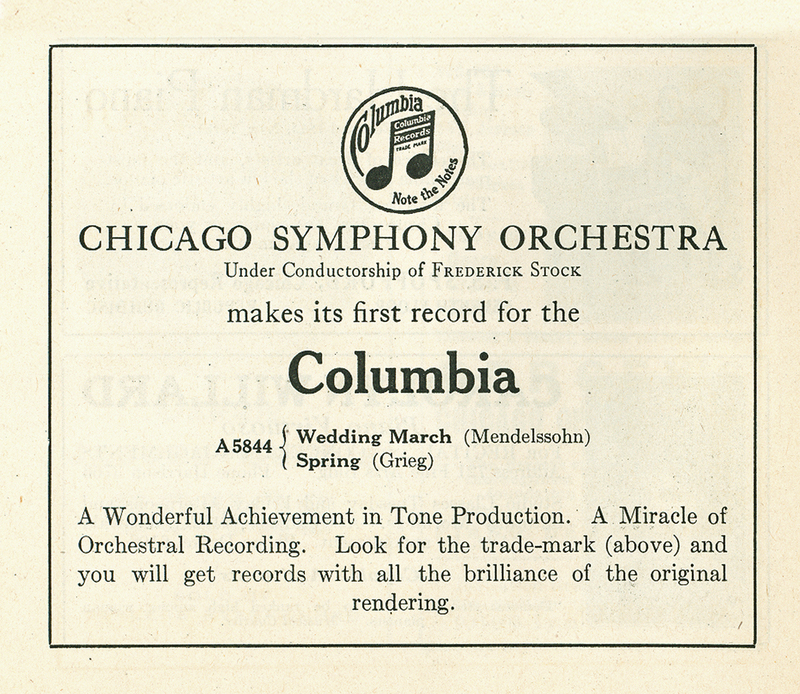 Frederick Stock and the Chicago Symphony Orchestra introduced the work to the U.S. on October 31, 1913. Virtually every Chicago Symphony Orchestra musician studied with a great teacher, who studied with great teachers before that—a process that traces back to Bernstein, Brahms, and Bach. Along with our beloved Italian maestro, Riccardo Muti, the members of the Chicago Symphony Orchestra Alumni Association are a living link to past generations of legendary performers, conductors, and composers, and our artist musicians hail from many different countries who share a common musical heritage. As we conclude the celebrations surrounding the Orchestra’s festive 125th season, the CSOAA also celebrates an anniversary this year—its twenty-fifth. 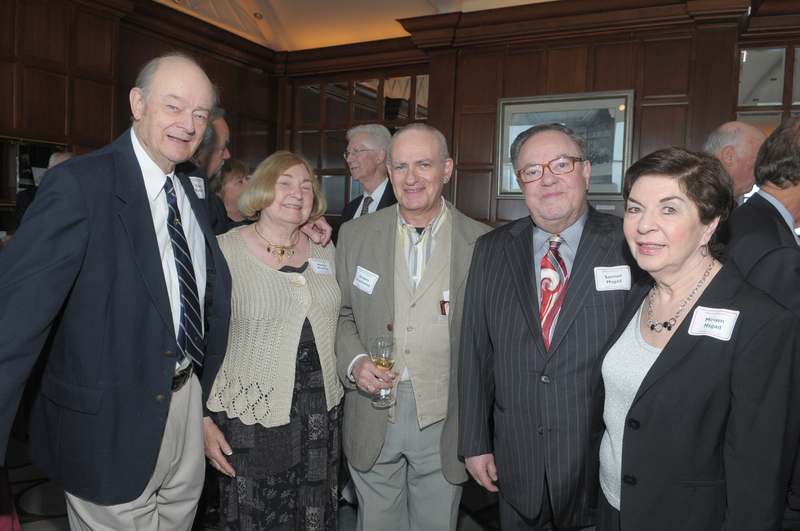 The CSOAA consists of nearly 130 members—including retired and former musicians, spouses, and children—an astonishing aggregate total of well over a thousand years of service to the Chicago Symphony Orchestra! 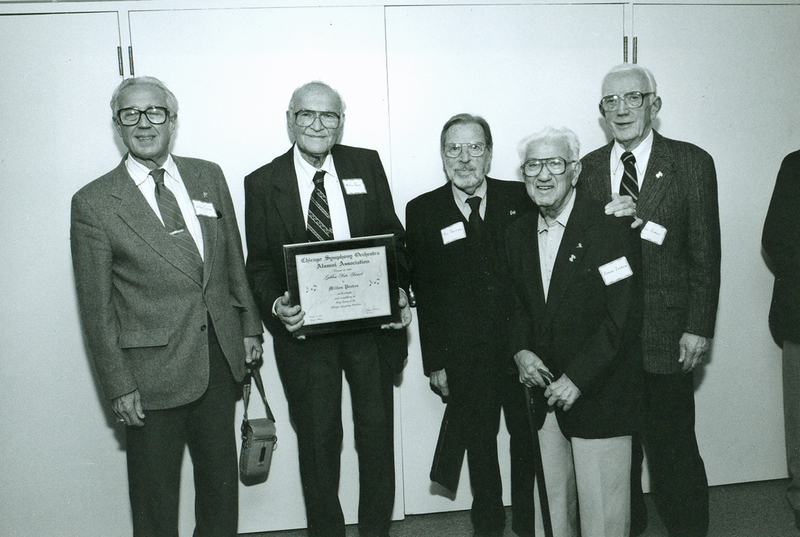 In 1991, Isadore Zverow (viola, 1945–1988) fostered the idea of the CSOAA, and subsequent presidents have included Sam Denov (percussion, 1954–1985), Phillip Kauffman (violin and viola, 1927–1930 and 1964–1984), Jerry Sabransky (violin, 1949–1997), and currently Tom Hall (violin, 1970–2006). Having performed for many years together on stages all over the world, alumni continue to interact with each other through the CSOAA; and each season, members receive discounts to concerts and the Symphony Store. 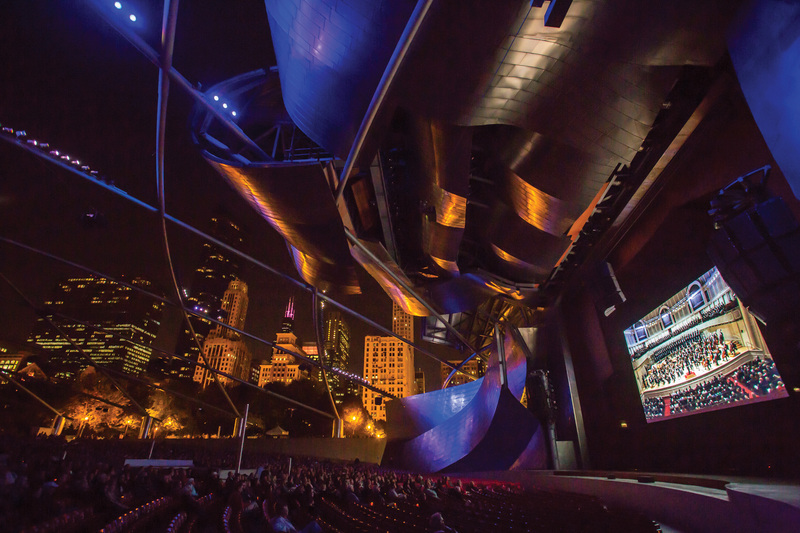 The organization enjoys the warm embrace of the Chicago Symphony Orchestra Association, which holds its former musicians close as senior members of the Orchestra’s family. 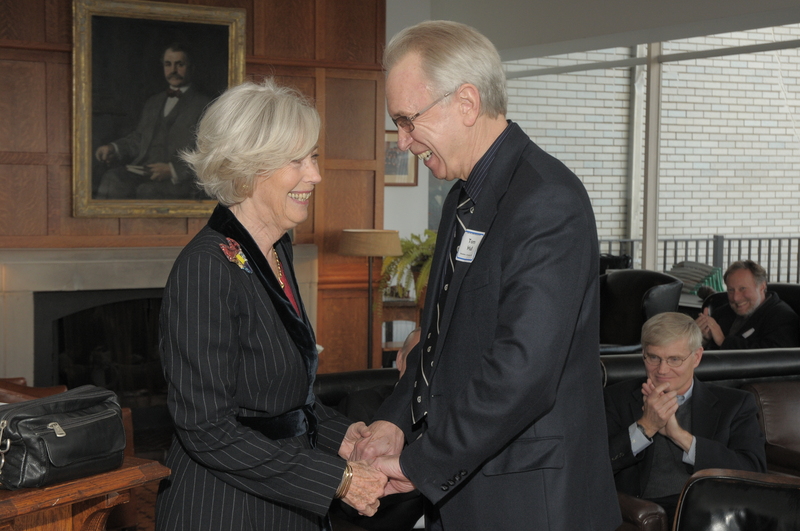 Current CSOA President Jeff Alexander has been most gracious in supporting the retirees, some of whom are well into their nineties. 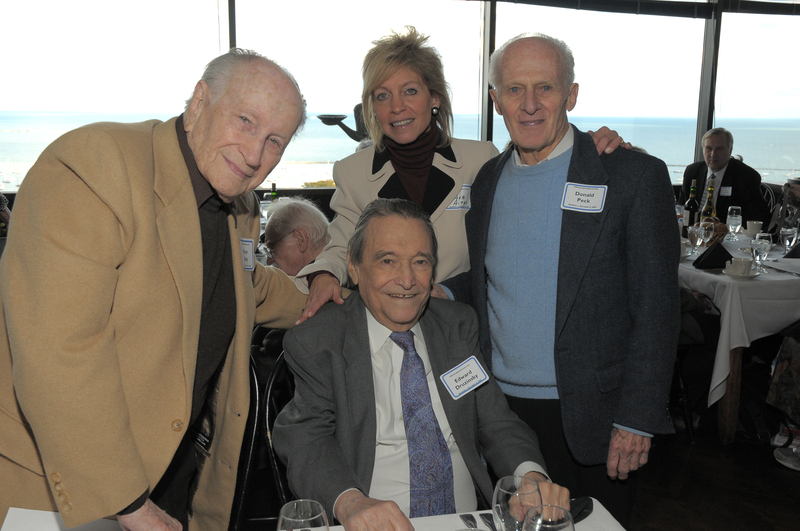 The CSOAA board of directors meets several times a year to plan annual reunion dinners, which are usually held at the historic Cliff Dwellers club. 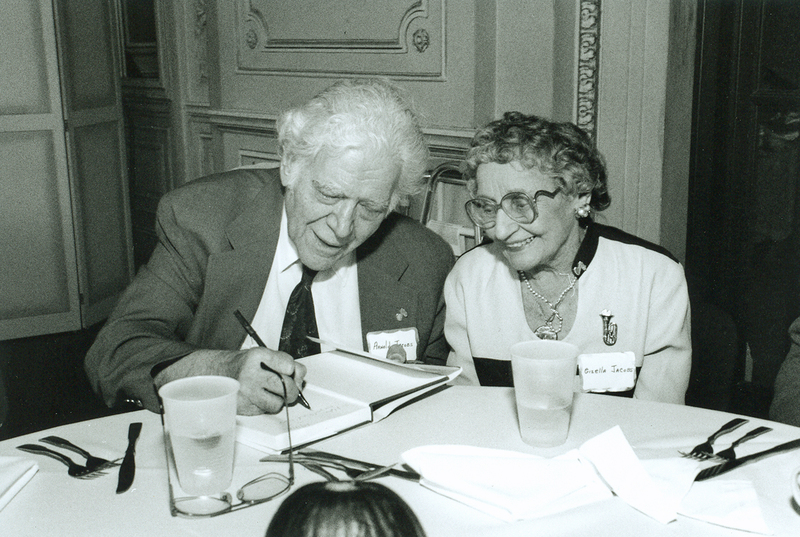 Members also have contributed to the CSOA’s Rosenthal Archives—a treasure trove of history, recordings, music scores, artifacts, and databases of former orchestra members—lovingly curated and managed by our liaison, director Frank Villella. So the next time you stroll through Symphony Center’s first-floor arcade, try to imagine the many great musicians of earlier generations behind each portrait—beautifully taken by photographer Todd Rosenberg—of the superb musicians of the Chicago Symphony Orchestra. This article also appears in the September/October CSO program book. 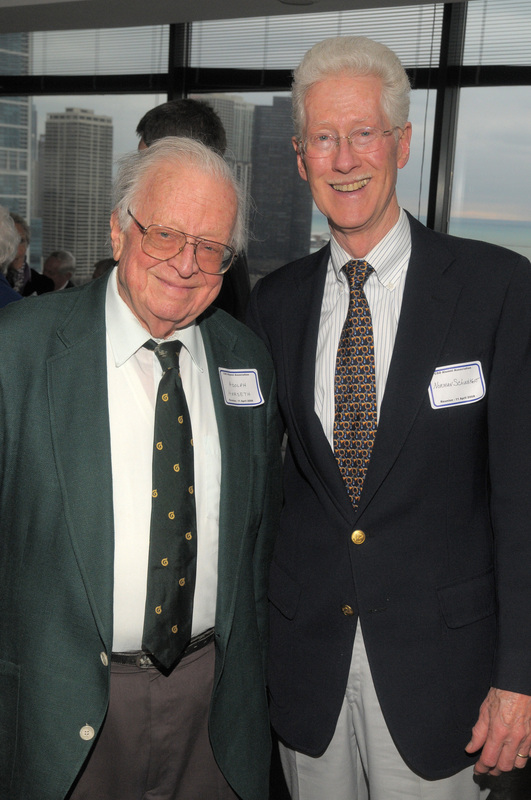 Donald Moline was a member of the Chicago Symphony Orchestra cello section from 1967 until 2006, and he currently serves as secretary of the CSOAA. The Art Institute of Chicago opened its new building—completed in time for the second year of the World’s Columbian Exposition—on December 8, 1893, at the intersection of Michigan Avenue and Adams Street. 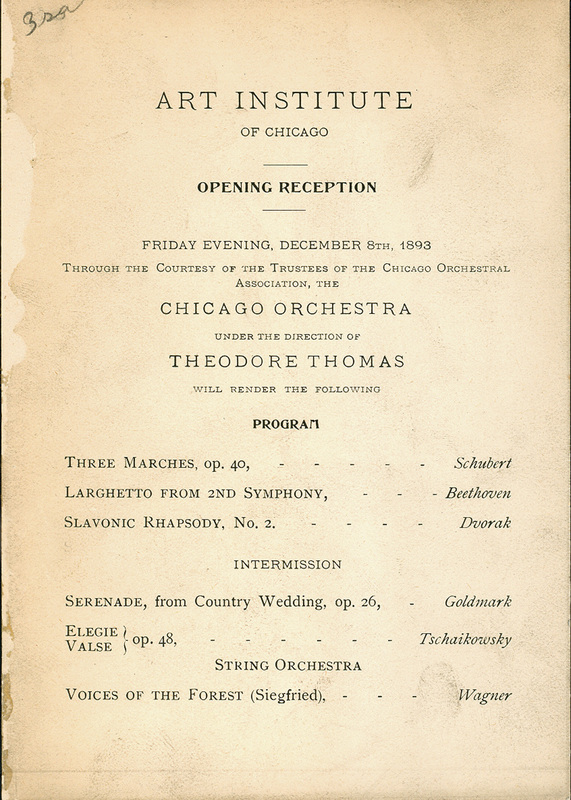 For the opening reception, Theodore Thomas and the Orchestra performed Schubert’s Three Marches (from the Six Grand Marches, D. 819, orchestrated by Thomas), the second movement of Beethoven’s Second Symphony, Dvořák’s Second Slavonic Rhapsody, Goldmark’s Serenade from The Rustic Wedding, the Elegy and Waltz from Tchaikovsky’s Serenade for String Orchestra, and Wagner’s Forest Murmurs from Siegfried. 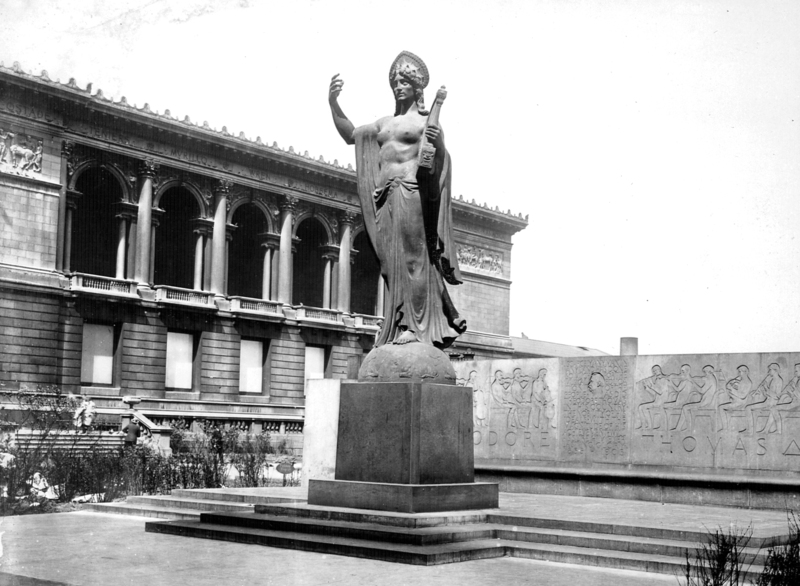 The Art Institute’s south garden was the first site of The Spirit of Music, a memorial to Thomas, originally dedicated on April 24, 1924. 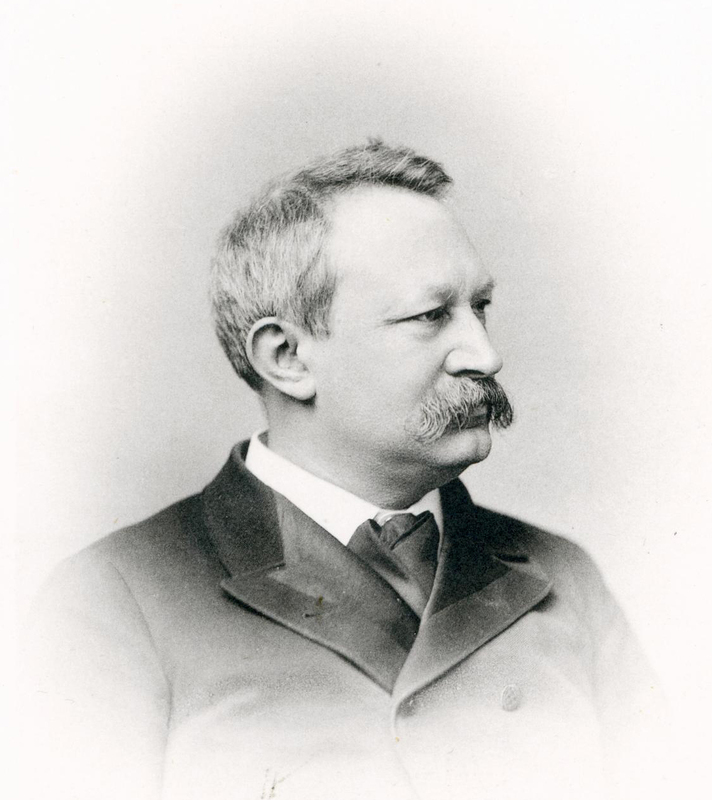 It was designed by architect Howard Van Doren Shaw and sculpted by Albin Polasek. Subsequently moved on multiple occasions and even temporarily presumed to be lost, the memorial ultimately was moved to Grant Park at the intersection of Michigan and Balbo avenues and rededicated on October 18, 1991, at the conclusion of the Orchestra’s centennial celebration. This article also appears here and portions previously appeared here and here. 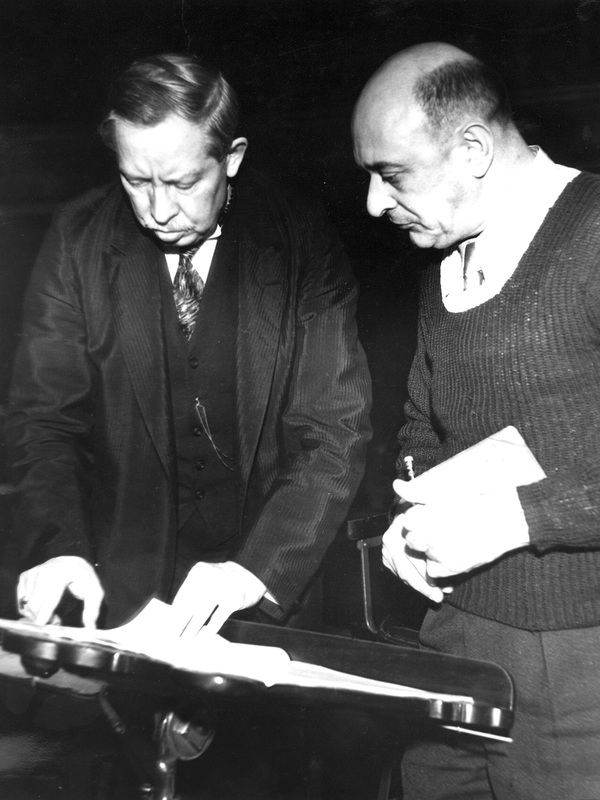 During the Chicago Orchestra’s thirteenth season, Theodore Thomas programmed Bruckner’s Ninth Symphony for its first performances in the United States. 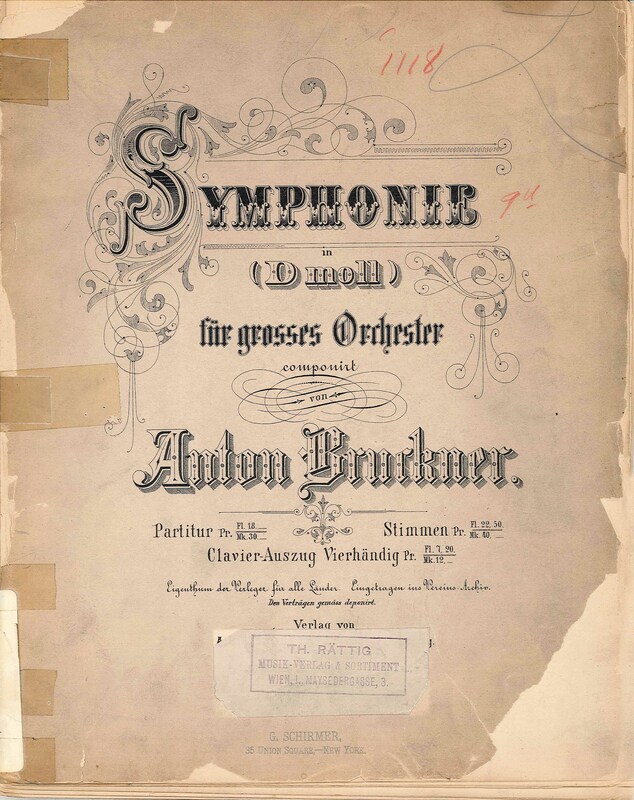 This was the fourth of Bruckner’s symphonies to be performed by the Orchestra in Chicago, as Thomas had already led the Fourth in January 1897, the Third in March 1901, and the Second in February 1903. On February 19, 1904, the capacity crowd at the Auditorium Theatre had gathered mainly to hear contralto Ernestine Schumann-Heink, one of the most famous singers of the day. 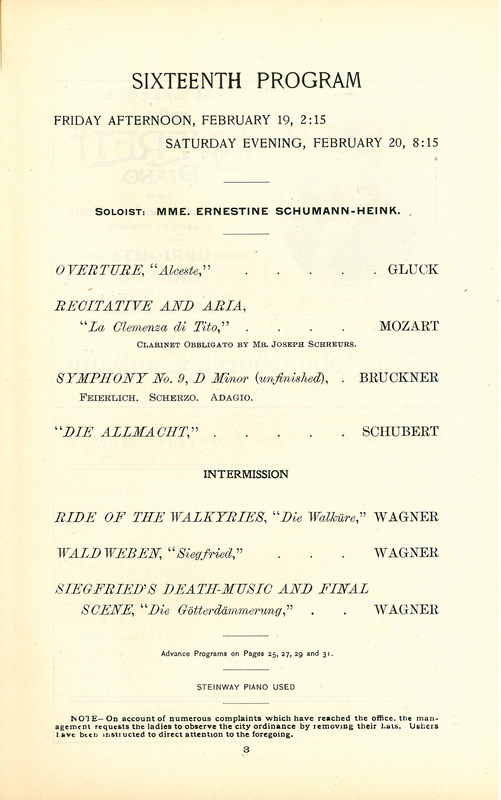 Thomas had strategically programmed the Bruckner on the first half of the concert between Schumann-Heink’s two selections—“Non più di fiori” from Mozart’s La clemenza di Tito and an orchestration of Schubert’s song “Die Allmacht”—to obviously assure that the premiere would be heard by all in attendance.